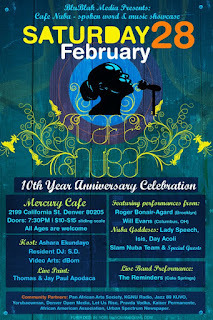 Denver Creative Happenings: Cafe Nuba 10 Year Anniversary Party!! Cafe Nuba 10 Year Anniversary Party!! Join Cafe Nuba on Saturday, February 28th in celebrating 10 years of spoken word and music showcasing local and national talent! This not-to-be-missed event is presented by BluBlak Media at the Mercury Cafe in downtown Denver and will be hosted by the (ever) beautiful, Ashara Ekundayo - Cultural Jedi of our "fair" city. DON'T MISS IT - THESE PARTIES ROCK! !